The industrial supply company is growing sales strongly, but what about its margin outlook? The industrial recovery in the U.S. is in full swing, and the latest results from MSC Industrial Direct (NYSE:MSM) on Oct. 31 served to confirm the positive trend. However, it's not all smooth sailing. End demand has been picking up for a while, but so far the industrial supply company hasn't seen it feed through into margin expansion. The fourth-quarter earnings played out these themes, but management served notice that an improvement could be around the corner. Net sales of $743.4 million came in toward the high end of guidance of $732 million to $746 million. Gross margin declined to 44.6% from 44.8% in last year's third quarter but was ahead of the guidance range of 43.6% to 44%. Operating margin was 13.5%, compared with 13.3% a year ago, as relatively lower operating expenses helped offset the gross margin decline. Diluted EPS of $1.07 beat guidance of $0.97 to $1.01. It was a good quarter for MSC Industrial, and although underlying gross margin continued to decline, operating margin increased because of operating leverage -- a company's ability to grow profit from additional sales. CEO Erik Gershwind began the earnings call by stating that "conditions steadily improved through the quarter as manufacturing continued to firm." In a sense, that's hardly surprising, because industrial production has picked up in the U.S., and industrial equipment wholesale companies are some of the most economically sensitive stocks on the market. In addition, MSC Industrial's manufacturing and non-manufacturing sales are now growing in tandem. 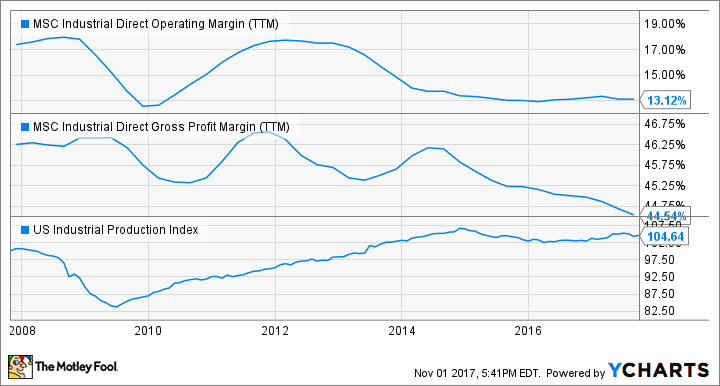 Now that the recovery is in full swing, the question is when the company's margin will turn upward so that the cyclical recovery can drop through into sharply increased profitability. Inevitably, the subject of margin and pricing power dominated the earnings call. This is a particularly important point, because management's guidance for the first quarter of its financial 2018 implies a similar scenario to the recently reported fourth quarter. In other words, gross margin, excluding DECO, is expected in the range of 44.2% to 44.6%, compared with 45% in the first quarter of 2017. However, excluding DECO, operating margin is expected to increase to 13.4% from 13.2% in the same period last year, just as in the fourth quarter operating leverage is expected to more than offset a gross margin decline. However, if MSC Industrial can grow gross margin again, then profit should improve handsomely. Ultimately, the problem is that MSC Industrial still doesn't have the power to raise prices and make them stick. Gershwind talked of "seeing more discrete signs of pricing firming in the marketplace," adding, "should we get ... some sort of moderate midyear price increase," there could be an improvement in operating margin. It's all about margin. Gershwind said he usually has pricing discussions with suppliers in November and December with regard to increases in January. Investors should look out for commentary on this in the next set of results, particularly as Gershwind talked of implementing a midyear pricing increase.